ORGANIZATIONAL STRENGTHS: 15 years successful history of partnering with Fortune 500 companies in the field of IT/Telecom Professional Outsourcing. Clients have included IBM, EDS, CSC, Hogan, AT&T, Cingular, T-Mobile, Sony Ericsson, Parsons, Telecom Specialists, BCI, Celcite, MCGSF, Pro-Tel Quanta, PRITHVI Solutions, Goodman Networks, SGA, MYcom-USA, CelCite, LemCon and others. Extensive international network of resources led by highly-respected, Texas-based Filipino civic business leaders and technology publishers have clout in both Asia as well as in North America. President and CFO Ethel R. Mercado is President of the Philippine-American Chamber of Commerce of Texas. Founding Chairman and CEO Gus Mercado is a former Philippine Consul General. The U.S. President served on his honorary advisory board for six years when he was Governor of Texas, along with Top Fortune 100 CEOs. He also served on the President's Advisory Council on Asian/Pacific Islanders Affairs (APIA). 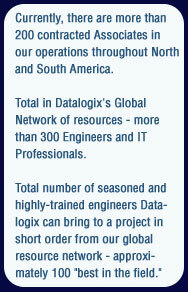 Datalogix Texas is a W/MBE Company ( a member of the USPAAC) and an Equal Opportunity Employer. Datalogix President Ethel Mercado is concurrently Honorary Consul for Texas, responsible for the well-being of about 200,000 Filipino nationals in the state of Texas. IT and Telecom Subcontracting, Training and Consulting on Ericsson, Nokia, Lucent and Alcatel systems. Installation, Commissioning, Integration, Testing and Troubleshooting, as well as Switch Network Engineering Operations and Maintenance 2G, 3G and LTE. RF Engineering Design and Optimization. Wireline Broadband, WIFI, Outside Plant Engineering Design and Roll-out Implementation. Business Process Outsourcing (BPO) and Call Center Operations, guaranteeing net savings of 30% to 40% of current costs. Click here for more info.